Plantronics Marque 2 M165 Bluetooth headset is the perfect companion for smartphones, with universal-fit conformable gel eartips, a DeepSleep power-saving mode and dual microphones that reduce background and wind noise for crisp, clear call quality. Listen to music or stream audio and Internet radio, manage your calls without pressing buttons - just say "Answer" or "Ignore". 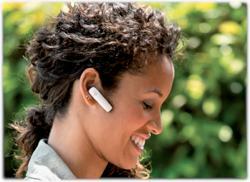 The dual microphones reduce noise and wind for enhanced call clarity (view larger). Featuring the latest Bluetooth 3.0 technology, the Marque 2 includes the A2DP Bluetooth profile for audio streaming capabilities, so you can listen to music, podcasts, or GPS directions from your smartphone. With its multipoint pairing capability, you can quickly switch active connections between two paired phones and answer calls from either one. 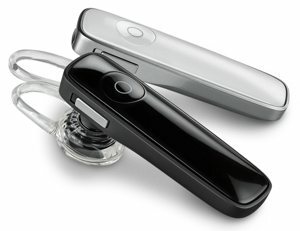 Other features include enhanced clarity on wideband-enabled smartphones, a comfortable fit in either ear with one of three optional eartips, and a voice-guided pairing process. Plantronics DeepSleep power-saving mode activates when your Marque 2 is away from your phone for over 90 minutes. When it's back in range (33 feet or less), you can just tap the Call button to "wake" it up. Using the DeepSleep mode can extend the battery readiness up to 180 days. 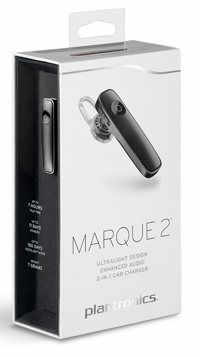 The Marque 2 lets you be truly hands free when a call comes in. You'll hear a ringtone in the headset, and then it will ask: "Incoming call, Answer or Ignore?" If you want to answer the call, just say "Answer." By saying "Ignore," the call is sent straight to voicemail. It's that easy. Tired of searching for your misplaced headset? 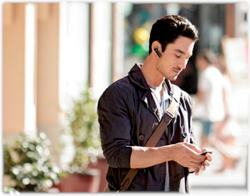 Find MyHeadset acoustically locates your headset by sending it a tone so you can hear where it's hiding. The app also features an on-screen headset battery meter in the notification bar for those with Android OS 3.0 or later. InstantMeeting automatically identifies conference calls and dialing details from your calendar, reminds you just before the meeting is scheduled to begin, and, with one touch, connects you to your conference call. Take calls without pressing a button--just say "Answer"
The Marque 2 in black.